Castle has been on TV for 5 seasons now. What is Castle you say? If you have a love for Nathan Fillion, then you already know and will now ask, 'what the deuce has taken you so long?' Yes, I am only starting to watch the show now. Hubbie and I watched the first season this past week......aaaaaand...... I LOVE IT!! I love Nathan Fillion....seriously, he is awesome! I think I first saw him in the show Buffy (at least that is the earliest I can think of), and then he was in Firefly (still upset that that show is no longer on.....but don't get me started). 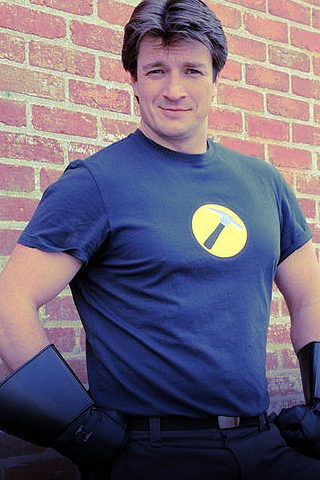 And of course he was Captain Hammer in "Doctor Horrible's Sing Along". (if you like/love Nathan Fillion and NPH you need to see this!) It is so freakin' funny. Now I think I need to be clear, I am not just watching Castle for Nathan Fillion. What? There's some truth in that. Granted, it was because of him that I wanted to (finally) watch it. But now that I have seen it, I like it for more than just Nathan Fillion. What? That's my story and I'm sticking to it! I'm pretty sure I watch Castle because of Nathan Fillion, well not entirely, but the man sure is charasmatic and expressive! I loved him in Firefly and Buffy and I think I would follow him from show to show because he's just so fun to watch. Hope you like the remaining seasons, the latest one is pretty awesome!